The third time isn’t always the charm. In 1947, after producing the blockbusters Oklahoma! and Carousel, Richard Rodgers and Oscar Hammerstein II reteamed for a musical called Allegro, a deliberately stripped-down production that included elements of Thornton Wilder’s Our Town (small-town setting, lack of sets), Sinclair Lewis’ Arrowsmith (a country doctor makes good in the big city), and any number of Frank Capra paeans to Main Street American values. But the show proved to be a box office misfire — and mostly disappeared into musical theater obscurity. It’s no wonder. On the basis of director John Doyle’s even-more-stripped down revival at Off Broadway’s Classic Stage Company, Allegro remains more of a dated curiosity than an underappreciated gem. Doyle does his best to update the material: He pares the cast to a trim 12, axes characters and scenes and tunes (and original director Agnes DeMille’s dream ballets) to get the running time to under 90 minutes, and simplifies the orchestrations to folksy effect. 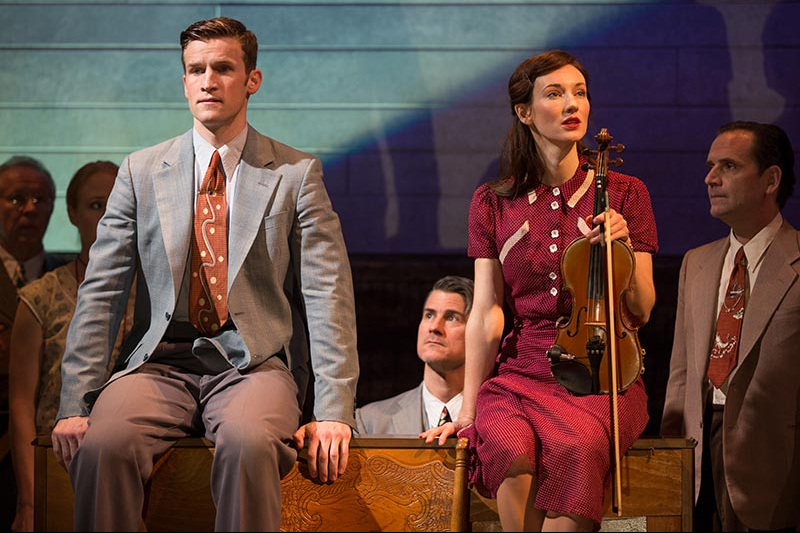 In a now-familiar Doyle-ism that suits the homespun storytelling, the cast doubles as the orchestra, playing everything from violin to cello to guitar to triangle to a center-stage upright piano. This may be the best, fastest version of Allegro you’re likely to see, and it’s nice to hear standards like “A Fellow Needs a Girl” and “So Far” in their original context from a first-rate cast. But the show itself is a muddle, a by-the-numbers bildungsroman following a country doctor named Joseph Taylor Jr. (the appealingly lantern-jawed Claybourne Elder) from birth to middle age. It’s a rather conventional story whose biggest surprise is also its most misogynistically troubling: Joe’s sweetheart from childhood, Jenny (Once‘s Elizabeth A. Davis), quickly emerges as an avaricious, manipulative bee-yotch who even throws down with his sainted mama (Jessica Tyler Wright).